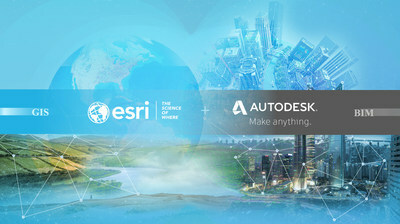 Autodesk and Esri Partnering to Advance Infrastructure Planning and Design | Autodesk, Inc.
LAS VEGAS, Nov. 15, 2017 /PRNewswire/ -- Autodesk, Inc. and Esri, Inc. today announced the start of a new relationship to build a bridge between BIM and GIS mapping technologies. Together Autodesk and Esri plan to enable a broad range of industries to gain better context by visualizing data of the man-made world, the environment, citizens and the networks that weave it all together. "It is important to consider the needs of future generations during the design and building of projects today," said Jack Dangermond, President, Esri. "The benefits of partnering with Autodesk will include securing sustainable resources for the growing population, a responsible human footprint on our natural environment, better use of our planet's resources and more resilient cities." "Partnering with Esri is intended to combine the power of BIM and GIS mapping which will enable our shared customers to build anything, anywhere," said Andrew Anagnost, CEO, Autodesk. "Our goals are to provide industry and city planners the ability to design in the context of the real world. This will allow communities to build more connected, resilient cities, and infrastructure with a focused eye on sustainability." "I'm thrilled to learn of the Autodesk and Esri strategic partnership," said John Kizior, Global Director, Project Technologies. "At AECOM, we value innovative spirit, and I'm optimistic that this new strategic partnership will produce dynamic software synergies. The combined technology sets has the potential to provide new ways of connecting information across the project lifecycle to the benefit of our clients." 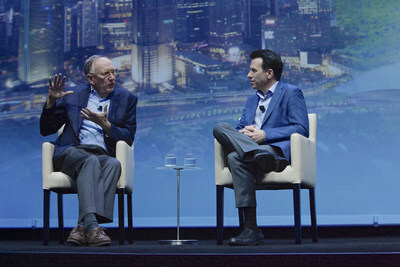 This vision was announced by Andrew Anagnost and Jack Dangermond at Autodesk's annual flagship user event, Autodesk University, in Las Vegas, Nevada. To learn more, please visit the Autodesk and Esri collaboration page. Copyright © 2017 Esri. All rights reserved. Esri, the Esri globe logo, The Science of Where, esri.com, and @esri.com are trademarks, service marks, or registered marks of Esri in the United States, the European Community, or certain other jurisdictions. Other companies and products or services mentioned herein may be trademarks, service marks, or registered marks of their respective mark owners.